THE BOY THOUGHT his heart would stop from the thunder sound the Gates made as they closed behind him. But he did not cry. He was more afraid than that. He only stood very still and small, and when the booming echo had slid down the pass into the forest, the boy still stood. He was alone and shut out. The high black doors of the Gates filled up the pass behind him, rising sheer and smooth to the rim of the plain. There was a stream near where the boy stood. It ran out from under the edge of the Gates themselves, down between the rocks and finally out of sight in the darkness under the trees. The great forest, stretching out from there to the edges of the sky, was called the UnderReach. The boy knew the ’Reach was the home of giants and monsters—other children had told him. If any people lived there, beneath the trees, they would be Shadowed, for the boy’s people had ever lived on the high, open plain, close to the sun, and only a man or a woman or a child who was found to be Shadowed was put out to live in the unknown darknesses of the UnderReach. The boy was afraid to go down into the woodland where the giants and the Shadowed people lived. He stayed where he was, near the loud little river, among the rocks at the bottom of the Gates. He waited. At night he cried to be let in, but in the gray daylight he did not cry at all. He only lay there dully in the wind and cold, waiting, among the white bones of other people who had waited. On the third day, two small rock sheep came up from the trees and watched him. Finally, boldly, they came to lick the salt from his skin. Their company and their brave faces gave him a little bravery. When they went back down to the woodland, he took his troublesack and slowly followed them. He had not, before this, stood under the roof of a forest. There were, here and there, solitary whip-leaf trees that grew on the plain; and once, when he had been still a very small child, the boy had stood beneath the branches of one of those trees, holding onto his father’s hand and staring for comfort out to the wide grassland and the big sky and the far flat line of the horizon. In the forest of the UnderReach where the sheep now led him, there was no horizon. The sky, through the tops of the trees, became quickly distant, broken in pieces and scattered. But he could not stay among the rocks, among the bones. And the Gates, at least, stood up so high he could see them every time he looked back that whole day and the next. So he kept on, following the sheep at first, and later going on alone, into the forest. It rained. Under the trees there was a slow, steady leaking. Slowly, steadily, the boy himself grew wet. The yellow dog’s-wool cape that had been in his troublesack let in the rain through its loose weave. There was a metal strike-fire in the sack, and a thin-bladed knife. With the knife he shaved little bits of tinder, but his small, stiff hands could not move quickly enough: Each time he struck a spark, the rain put it out. So he was cold, too, and after that, sick. He lay on the puddled ground, with the wet cape pulled close, and shook. The Gatekeeper, as he had given the boy his troublesack, had seemed to say by the look on his face, You see, we are not pitiless. But afterward the boy had seen the rotted rags of troublesacks among the bones at the bottom of the Gates, and he thought he would die now, himself, holding the strike-fire and the knife in his fist. He thought perhaps all the Shadowed people shut outside the Gates had died thus, alone and cold and afraid, and that after all, there were only giants and monsters alive in the forest of the UnderReach. So he cried out loud when he saw that someone had come silently to stand above him. And still he cried when he saw it was a man, neither giant nor monstrous, who stood looking down on him. The man did not speak, he only stood and stared at the boy, but he had a bony, angry-looking face, eyes hidden below fierce brows, and wild red hair sticking out from beneath a pointed hat. And he was Shadowed, surely, for there were no other people known to live in the ’Reach. The boy had still a child’s notion of the shapes a Shadow could take: He imagined the man might turn him into a calf or a goat and then kill and eat him. So he lay helplessly under the man’s steady stare, and he cried. Rain dribbled from the wide cone of the man’s hat down onto the boy’s face. Then the man did make a small movement of anger—a shrugging of his shoulder, a pushing-away with one hand. But it was the rain, not the boy, that had annoyed him. The boy still heard its whispering sound, still saw it like a curtain in the far trees, but now the rain no longer fell where the man stood, nor where the boy lay. The man had simply, by moving his hand, made a dry place for them both, in the wet day. In a while, when the boy’s tears had gone dry too, the man said slowly, “They have put you out of the Gates, have they.” The voice was unlike the frightening face. There was no anger in it. There was simply a heaviness, like sorrow. Then in a moment he said, “Was put out young, myself,” as if it were a surprise to him, something he had not thought of before now. The boy began to cry again, but not this time from fear; and in a while, without saying anything more, the man squatted down and gathered the boy up gently in his arms as if he were not a lean-legged child, instead a baby with legs too wobbly for walking. The man, Rusche, had a house that was made like a weaver-bird’s nest, of small sticks and grass and mud, with a rounded roof and slanted sides and a small low hole for a door. He had not put it high on a limb as a weaver-bird would, but instead had built it on a hillside, under big old teba trees, so the thick boughs of the trees would help to keep the rain off the roof. If the tebas could do the work of keeping the house dry, he was glad to let them. Sometimes, though, in that first autumn Rusche and the boy were together, rain fell hard right through the arms of the trees. Sometimes a wind flapped the clouds like sheets of cloth. Then Rusche—with a look in his face that was both cross and ashamed—would set a warm little whirlwind by the doorhole to keep the cold from blowing in. Or he would thin the rain so it fell fine and dry as dust through the smokehole in their roof. And by such homely weather-working, Rusche—and now the boy, Vren—lived most of the time snug and dry. They were sometimes hungry. In that fall when Vren first came, the ceiling and walls of the little house were lined with stores the weather-worker had put by for winter. He had bunches of dried chai and tea-moss, baskets of po nuts, long braids of elbec bulbs. And the stiff, dark bodies of tayfish and brush-rabbits, smoked until they were dry and hard. The boy ate the chai, in a salty thin broth, and he liked a pudding the man made by crushing elbec with a stone and cooking it thick. But he could not eat the dead animals. He had long ago learned to pretend, and he did that now, carefully. Yet each time Rusche ate of meat—and the boy pretended to eat of it—the man looked round at the boy silently. It was a look that stopped Vren’s breath. His own people had taken notice, slowly, of uneaten meat, and then more quickly afterward they had become aware of the grass snakes and the owl and the old mole Vren had secretly befriended. And though his father drove off the snakes and sealed every mole’s burrow with salt and stones, and though his mother held his chin and fed him the owl’s own flesh, someone by then had already whispered “Shadowed,” and he had been put out of the Gates. Now, the look in Rusche’s face made him remember the darkness that had been in the faces of his people, in the days before he was put out—and at night now he cried, with his fist against his mouth to keep the sound in. The boy ducked his head. No one inside the Gates had given a name to his Shadow, as the man did now. He had to think a little, to know what answer he could make. “No,” he said in a low voice, without looking at Rusche. Then, because the man waited, and continued to watch him, he thought of something more to say. “So much of their language is Smell,” he said shyly. Rusche, in a moment, made a wordless grunting sound. The boy could not tell whether it meant understanding, or doubt. Afterward, though, the man put all of the meat out of the house. He buried or burned it, or perhaps he left it on the frosted ground for the hungry blue ravens and the spotted wolverines. The boy and the man ate carefully of what was left, growing thin together over the cold season. Vren slept, finally, without those dead animals in the darkness of the house there with him. And finally he saw, below the man’s great, angry-seeming brows, eyes that were green and patient and kind. In the winter, when ice was in the river, the boy and the man walked to a place the man called the Cat’s Tail. “It will be frozen now,” Rusche said, as if that were reason enough for going. The boy walked the whole way there on his own legs, lifting and setting his snowshoes down in the tracks of the man without often falling behind. They stood and looked at how beautiful the falls were, frozen, like a rope of white glass in the cold—and it was, after all, reason enough for going. Afterward, without speaking of tiredness, Rusche simply carried the boy home on his shoulders. The boy rode with his cold hands pushed inside the neck edge of the man’s cape and his cold cheeks burrowed in the man’s thick red hair. He even slept a little, rocked by the man’s steady stride. From the edge of sleep, it seemed to him that he heard no walker’s chant, instead a cradle song. In that winter, when the wind drifted the snow in high swells, Vren made caves with long tunnels joining them together. He and the minks and the big white snow skunks played games of go-seek in those cold bluish burrows. Sometimes he imagined he could dig a snow tunnel all the way beneath the Gates, and climb out on the other side, on the high plain where his people lived. In that daydream they were glad to find him again. He imagined that he had, after all, only been lost, and not put out. They set their robes about his shoulders and let him sit in the best place in the kin-house, close beside his family’s stove. His mother brought him milk-sweetened tea in a big metal cup, and afterward held him close and sang softly until he slept. In the spring, in the time of tiny green buds, the boy and the weather-worker went up to a place the man called the Basket Meadows, to dig the sweet bulbs of elbec and gather their long thick leaves. The night sky over those meadows seemed very clear and close, like the sky over the plain. Though they did not know the true names of the stars, Rusche and Vren lay on their backs and looked for shapes of their own in the aimless, endless star field—a seed-comb here, a hat or a kettle there. Afterward, the boy painted the shapes and names on a circle of teba-cloth, and he rolled up that star chart carefully, meaning to save it. He had found, all alone, the shapes of the yellow bear and the short-tailed hawk. He thought he and the man might be able to name the whole sky, little by little, if they were patient. It was only some time afterward that he remembered his daydream and wondered whether his family would come looking for him, to take him home, before he and Rusche had finished naming the stars. In that spring, when the leaves came out on all the hardwood trees, the boy climbed high among the houses of the black squirrels and the woodhole birds, and they played with him their games of drop-cone and who-sees. From there in the trees he could see the sheer edge of the tableland standing up, bluish in the distance. Sometimes, if he stared hard enough, and if the sky was very clear and light, he even thought he could see the sun flashing off the smooth blackness of the Gates. He liked to look toward that place where the plain began. He imagined, if he let loose his toehold in the tree, he could take flight like an archeagle and glide on the long wind over the Gates to the people on the other side. He imagined his mother weeping as she held him, and his father carrying him home high and proudly on his shoulders, singing a loud song of celebration. But sometimes, in that daydream, he only swooped in low and angry over the heads of the people and raked his long eagle’s talons in their hair. Then he would see all their faces jerking up, staring at him in surprise and fear. Sometimes, as in the other daydream, his mother wept. In the summer, from the time of ripe strawberries, the boy and the man began to spend many of their days far afield. They hunted mushrooms and red onions, berries of many kinds, and the soft, peppery new shoots of salset. And from time to time, on their far walking, they came on the lonely house of a neighbor or the camp of a wanderer. The people of the UnderReach lived, nearly all of them, alone. They made no villages and few families. “They have no pride,” Rusche said in a rough voice, as if that were reason enough. Vren, without understanding the word, understood the meaning. He had, after all, not been lost, but cast out. Rusche would often take the boy’s hand and stand at the edge of a camp, waiting until they were seen, and then waiting again for welcome. If a tea-bowl was carefully tipped and spilled on the ground, they went away without a word. But if the bowl was filled up high enough for sharing, and the boiling-rocks put to heat on the fire, then they came slowly in. Rusche and the other person would sit opposite one another and shyly speak their little bits of news: a death they had heard of, a new house built or a house left suddenly empty, a man or woman met on a trail. They shared, also, the small, important ways each of them had learned to live in the forest of the UnderReach: this tree’s leaf or that plant’s flower they had found fit for food or for comfort. Often, wanderers spoke of the landmarks of the ’Reach as they were known in small ways to each of them, so the boy learned the edges of that vast forest: a high white line of mountains, a stormy lake without a far shore, a broad ironwood thicket where no animal lived. He wondered if anyone had ever gone outside the borders of the UnderReach—and he wondered, if he left the ’Reach, if he might not be able to leave his Shadow at its edge. Seldom, and vaguely, someone spoke of the tableland, or the people who lived there on the high plain, or the Gates that guarded those people from Shadows. Then Vren listened in silence and dreadful curiosity. But the Gates had been built so long ago that it seemed no one now alive, in the forest or on the plain, remembered the true reason. Inside the Gates there had been only old tales, as vivid and terrifying and inexplicable as nightmares. And outside the Gates it seemed there were only old habits, of fear and of shame. In the long, still days of that summer, when the air stood thick and hot under the trees, the boy swam in the river. There was a ring-tailed otter who lived in the reeds a little way upstream, and often the boy and the otter would dive from high rocks straight into the deepest part of the water, or they would race one another hard upstream against the current. Rusche had named the river White Stone, but the boy imagined it was the same one that ran out from under the Gates, the little stream those people called the Tilseth. He wondered if he might be strong enough, by now, to swim all the way up the river to that place where the White Stone River ran under the Gates and became the Tilseth. Later, in a dream, he became a tayfish and swam under the edge of the Gates and up the rocks of the pass into the clear brightness and wind of the plain. In that dream, he stepped out of the water among the long stone kin-houses of his own village. No one would speak his name. Their looks made him feel afraid and dangerous and powerful. Their faces were all white, and he could smell fear on their bodies. He could not tell which of the terrible, frightened faces might be his father’s. He woke, sweating, and heard the sound he must have made, the little cry. But Rusche’s hand was touching his wrist gently, silently, in the darkness, and in a while the last of the dream leaked out into the night. For a while, when the fall came round again, the rain fell straight and fine and silent, as if it would not ever be finished. Then the boy and the man spent whole days inside their house, playing games of Seven-Sticks, weaving rain capes from the inner bark of the teba tree, braiding sandals from the dried leaves of elbec. Rusche kept a long teba-string with knots in it to mark the days and the seasons; and one day, holding the boy’s small hands in his own large, freckled ones, he showed him how to tie a knot that would mark Vren’s first year outside the Gates. Then he let go the boy’s hands so he might tie that knot himself. Afterward, the man made a sweet, wet cake of honey and blackberries and flour ground from seeds of wild blue rice. “It has rained for seven days,” he said gruffly, as if that were the reason for sharing a sweet treat. By that fall, the red-back wolf pups born in the spring had grown out of babyness. When the fall’s weather went dry and windy, Vren spent three days with them. It felt good to be able to wrestle roughly with someone and play serious games of hunt-and-ambush in the thick brush below the den. And he liked to feel himself part of that big family, to share in their noisy, open love. In the darkness, the boy raised his voice in high wailing star-song with the pups and the parents and a young uncle who had become his particular friend. He even slept in the wolves’ small den, curled up tightly with the others so there should have been no room for loneliness. In a while, though, he found he was homesick. From the ridge behind the den he stood and watched the great flights of gray fisher-geese. From that high place, on the clear days, the line of the tableland seemed very close, as if one might walk to the foot of the plain in an afternoon. But the boy did not look toward the Gates. For a while now, he had only seen the faces of those people in his dreams. He watched the geese. Then he bumped noses with each of the wolves, in thanks and farewell, and he went home again to Rusche. 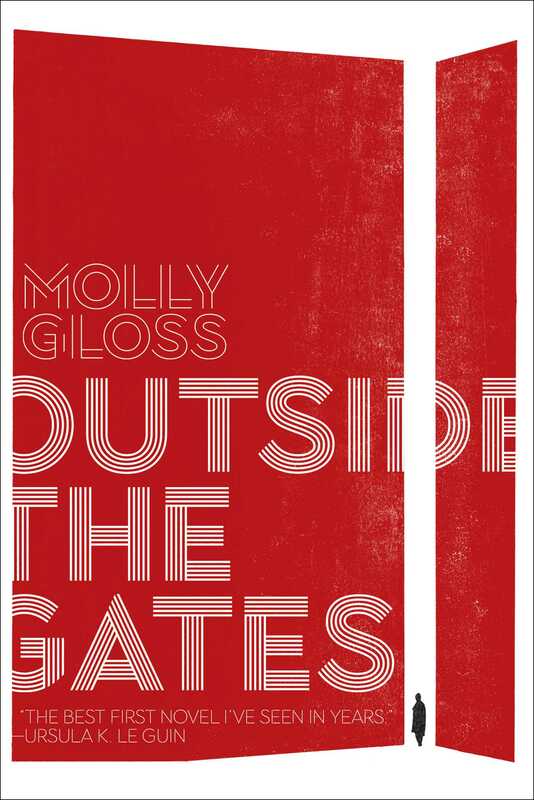 Molly Gloss is a fourth-generation Oregonian who now lives in Portland on the west side of the Tualatin Hills. She is the author of five novels: The Jump-Off Creek, The Dazzle of Day, Wild Life, The Hearts of Horses, and Falling from Horses, and one collection of stories, Unforseen. Her awards include the Oregon Book Award, a Pacific Northwest Booksellers Award, the PEN West Fiction Prize, the James Tiptree Jr. Award, and a Whiting Writers Award; and her short story, “Lambing Season” was a finalist for the Hugo and Nebula Awards. Her work often concerns the landscape, literature, mythology, and life of the American West.